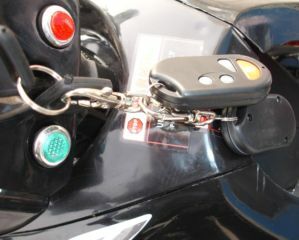 China ATV Repair Is So Easy..... Well you know! Click here to watch some repair videos! Maybe its an electrical problem! China ATV repair can be a very daunting task for people. When approaching a dealer for "the big three" Japanese brands, you'll likely get a resounding "NO, we don't work on those"! Most people will call the guy that sold them the ATV and if they are lucky, they get a replacement part! That won't do you much good if you can't diagnose the problem. This does'nt have to be the case. ATV won't start? Click here for FREE troubleshooting tips! For information on Kids Quads click here! China ATVs are very much like Japan made ATVs but are actually more simplistic in design. 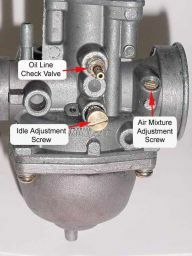 The engine parts are generally easier to access, and they follow the same basic design. While you will see a few 2 stroke ATVs, for our purposes, we will be discussing the 4 stroke engine ATVs as they are for more popular. Looking for information about China Scooters? Click here! Click here for Free information about Dirt Bikes! 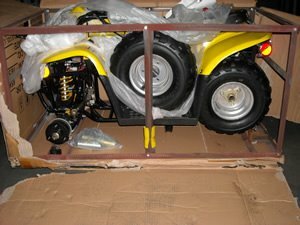 Along with a few other differences, safety features also seperate China ATVs from the Japan made quads. The triggering or Non-triggering of these features can cause a unit to be inoperable. In the following pages, we will discuss the locations of these safety features. We also will show you general maintenance tips. You will be delighted to see the answers to your repair questions also, along with detailed pictures and video when possible! It is truly my goal to make you comfortable in your purchase of any China ATV, Scooter, or Dirt bike!